Hawaii’s “Garden Island” offers a range of sights and attractions from its rugged cliffs, botanical gardens, waterfalls, to its historic small towns and colorful culture. Kauai is the oldest of the main Hawaiian islands, and its landscape and coastline has been created from nearly 8 million years of exposure to wind, waves and rain. Here’s a list of top things to do shared by the Kauai Tourism Office, along with a couple of our favorite experiences. We have explored about half of this list, and plan to return to experience the rest. There are many things to do and see on Kauai — visit art galleries, zip line over tropical rainforest, cycle coastal trails, kayak sacred rivers, snorkel Anini Beach, tour the botanical gardens (268 species of rare native plants) at Allerton, watch the sunset at Polihale Beach & more — horseback ride, ATV rides, golf, scuba! One of the best ways to see the island is to take a helicopter flight and a Na Pali boat cruise. 1. Cruise the Na Pali Coast on Captain Andy’s Yacht! The 22-miles Na Pali coastline is a breathtaking coastal range with majestic cliffs, lava tubes, beaches, caves, waterfalls and verdant valleys that can only be accessed by hiking, sea tour or helicopter tour. This is a definite must from our Kauai top 10 attractions! We recommend booking a Na Pali Coast cruise on Captain Andy’s Yacht — click here to make a reservation. They have been offering boat tours since 1980. Choose from their 65′ Star Yachts, Classic Sailing Catamarans, or Wet & Wild Raft Expeditions, or go on all of these unique and fun excursions. We boarded the custom 65′ Star Class luxury catamaran for a well organized 5-hour tour of the Na Pali Coast that included a delicious breakfast and a Hawaiian BBQ lunch with drinks. Our Captain Mike was skillful and knowledgeable of the ancient legends and shared Kauai’s history & culture. The friendly crew Maddy & Cassie spotted a massive pod of Hawaiian spinner dolphins, pilot whales, green turtles, and schools of tropical fish. Our adventure left on an early departure from Port Allen on the West shore of Kauai, and we saw views of Niihau, Polihale and the ridges of Kokee, as we sailed toward the coast of Napali. The 3,587-foot-deep Waimea Canyon is nicknamed “The Grand Canyon of the Pacific” with dozens of trails to choose from. We hiked the Waipo’o Falls Trail, about a 4 mile loop, that follows the same path as the Cliff trail, starting along Halemanu Road. At the end of this trail, hikers will have panoramic views of Waimea Canyon while standing at the top of one of Kauai’s highest falls. Click here to find a list of trails and updates. Kauai has the only navigable rivers in Hawaii, and the Wailua River is one of the most popular. We paddled the sacred river that was home to the first Hawaiians 1500 years ago. Our guide Thomas shared the history, flora & fauna as we visited an ancient Hawaiian village along this jungle river. He prepared a freshly cut pineapple for us to taste and we soaked in the beauty of this area. 4. Cycle the Kapaa Coast with Coconut Coasters! Another highlight was cycling the long coastline of Kapaa with Coconut Coasters. We cycled miles along the bike path that hugs the beaches and sparkling blue Pacific Ocean on the eastside of the island. Hundreds of coconut palms line the path and we rode in comfort on new Trek Beach Cruisers. We loved our 10 miles of pedaling into paradise along the Ke Ala Hele Makalae, the path that goes along the coast. The beaches at Poipu are some of the island’s best places to soak in the sun, catch a wave and snorkel. The Poipu Beach Park, on Kauai’s south shore, was once voted “America’s Best Beach.” Don’t Miss! Hike the 10 mile Koloa to Poipu trail, the Koloa Heritage Trail, known as Ka Ala Hele Waiwai Ho’olina o Koloa,. Wailua Falls, Kauai – Wailua Falls is a cascading 80-foot-high waterfall located north of Lihue. Opaekaa Falls, Kauai – With a roadside lookout, this is one of Kauai’s most accessible major waterfalls. Considered to be Kauai’s best luau, the Luau Kalamaku at Kilohana Kauai offers a traditional dance performance with local dancers and storytelling told by islanders about their ancestors who came to this 5 million year old island in 400 AD. This theatrical luau takes place at Kauai’s legendary Kilohana plantation estate. Hanapepe Town, Kauai – Known as “Kauai’s biggest little town,” Hanapepe Town is the art capital of Kauai. Visit art galleries like Amy Lauren’s Gallery or Halelea Art Gallery, where local artists sell their paintings, sculptures and other goods. It also has an excellent sushi restaurant called Japanese Grandma’s Sushi, and next door there is an excellent clothing & souvenirs boutique called Blu Umi. Just across the street and you’ll find some of the freshest multi-grain breads baked at Midnight Bear Breads. Don’t Miss! Friday nights when locals and visitors come to see the art galleries and taste some local delicacies from the food trucks. Lihue – Pick up a fresh floral lei at WalMart or Costco (find a variety of leis in the store refrigerators). Koloa – Quaint town with typical Hawaiian cottages, art galleries. Find floral leis and groceries at 90 yr old Sueoka grocery store or shop at Big Save grocery store. Pick up some fresh poke for lunch at Koloa Fish Market located at: 5482 Koloa Rd. Kapaa – You’ll discover cafes, boutiques and one of the most colorful fruit stands on the island – papayas, mangos, coconuts! Charming boutique called Kiko’s and pick up the best frozen yogurt at The Spot @TheSpotKauai. Stay healthy and stop by the Kauai Juice Co. for the freshest and healthiest cold pressed juices. Kilauea – Stop to visit the historical Kilauea Lighthouse as you head to the northern shore. Hanalei Town, Kauai – Next on our Kauai top 10 attractions is the timeless Hanalei Town is home to taro farms, art galleries and the Hanalei Pier overlooking beautiful Hanalei Bay. Look for the Aloha Juice Food Truck in Hanalei – best smoothies and island granola. 9. Take a Blue Hawaiian Helicopter Flight! Definitely one of the best ways to see the island in 1 hour! Blue Hawaiian Helicopters tours offer helicopter sightseeing rides in Hawaii on the islands of Oahu, Maui, Kauai and the Big Island. “Blue Hawaiian has been Hawaii’s air-tour leader for over 25 years and is the only helicopter company serving all four major Hawaiian Islands” according to our pilot Marty. We attended a safety briefing before our flight around the island. It’s the best way to get a tour of the island in 50 mins “starting over the Hanapepe Valley, then continues on to Manawaiopuna, commonly referred to as “Jurassic Park Falls.” Next it’s up the Olokele Canyon before moving on to eye-popping Waimea Canyon. Then, the sculptural masterpiece of the Na Pali Coast gives way to the Bali Hai Cliffs, and the pristine blue waters of Hanalei Bay and the Princeville Resort area. Weather permitted us to visit Mt Waialeale, the heart of the ancient volcano. This is the wettest spot on earth, with an average rainfall of 450-500 inches annually! Flying into the center of the crater with its 5000-foot walls towering above and its 3000-foot waterfalls surrounding us!” A truly awe-inspiring finish to our ECO Adventure over the Garden Isle. Our experienced pilot was experienced, informative and engaging. Our flight is described by Blue Hawaiian as a first-class ECO Adventure over the Garden Isle of Kauai in the incredible new Airbus Eco-Star. This state-of-the-art marvel gives you 23% more interior room, individual Business Class style seats, two-way communication with your pilot, and expansive glass for outstanding sweeping views of Kauai’s incomparable natural beauty. Good to note: tour routes and sights visited may vary according to wind and weather conditions. Blue Hawaiian has received awards from National Geographic Magazine, Frommer’s Hawaii, The Travel Channel and more. Check into a heavenly and tropical oasis, the Anara Spa at the Grand Hyatt Kauai for a relaxing spa treatment, steam, sauna and Jacuzzi soak. Surrounded by peaceful pools, Eden-like gardens and waterfalls, Anara Spa offers treatments that combine ancient Hawaiian healing traditions with the soothing powers of nature to inspire lokahi – balance or harmony. I found lokahi when I heard Charlita and Melanie extend a warm “Aloha” welcome as they thoughtfully attended to my needs. The soft and natural ambient music set a calm tone, and the sweet sounds of birds and subtle ocean winds filled the air in my open-air private pavilion, as I enjoyed a lovely Lomi Lomi massage in a Hau (garden room) at Anara. Followed by a eucalyptus steam shower, sauna, and jacuzzi, I reclined on the spa lounge chair, and enjoyed healthy snacks and cold pineapple infused water. I can’t remember a time when I felt more relaxed. As you plan your next trip to Kauai, be sure to enjoy a day at the Anara Spa! 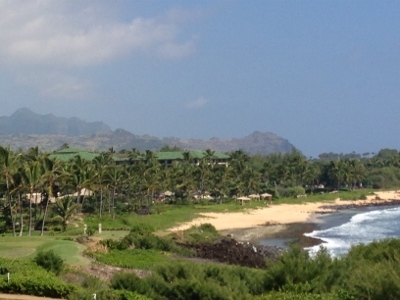 Kauai offers a range of accommodations from luxury resorts to condo timeshares and rentals. We stayed on the southeast area in Poipu at the Grand Hyatt Kauai Resort & Spa. Our room was spacious with incredible views of the resort landscape and ocean. We were pampered at the Anara Spa, and later dined at Tidepools restaurant. The Grand Hyatt is located on one of Poipu’s most stunning beaches with breathtaking views of the mountains, blue sea and lush gardens. There is an adult pool area and a separate family pool for children to play. There’s also a lagoon where everyone can find a place in the sun, or opt for a lounge chair under a thatched roof. There are several activities offered — Wildlife Walk, Garden Tour, Flower Lei making, Hula lessons, or Golfing at Poipu Bay Golf Course, and Spa Classes (pilates, yoga, zumba, fitness walks). Check the schedule for the Kauai Crafters — Hawaiian Palm Baskets, Lauhala Leaf Weaving, Tapa Cloth and Coconut Shell items. Don’t Miss! Hawaiian Music and Hula at the Seaview Terrace. North Shore: On our next trip, we hope to explore more of the northern shore and stay at the St. Regis Princeville and a beach house villa rental in Haena, click here. Dine and watch a beautiful Kauai sunset at the Beach House! Friendly Hawaiian service, fresh seafood and some of the best sunset views on the island. We ordered the fresh fish tacos and grilled catch of the day. Be sure to order a tropical drink with an umbrella on top! For a romantic evening, be sure to dine at Tidepools located at the Grand Hyatt Kauai. Modeled after a Hawaiian village, Tidepools’ thatched roof bungalows are surrounded by a koi-filled lagoon and tropical gardens. The Hawaiian inspired menu has a variety of fresh seafood and steak dishes to choose from. One of our favorites is the macadamia crusted mahi mahi! The Eating House 1849 in Koloa was inspired by Hawaii’s early restaurateurs like Peter Fernandez who opened one of the first restaurants in 1849 called the Eating House. Our server told us that award winning Chef Roy Yamaguchi blends simple flavors of a plantation town with the dynamic modernity of haute cuisine, using local produce from farmers, ranchers, foragers and fishermen. Don’t Miss! The potstickers and the popular butterfish hot pot with jasmine rice. Tiki torches light the way through beautiful Moir Gardens of orchids and bromeliads surrounded by coconut and kou trees, at the restored Koloa sugar plantation home located at the Kiahuna Resort. Guests dine on fresh catch of the day caught by local fishermen and salads are created from organically grown vegetables and herbs picked fresh on nearby farms and from the plantation’s gardens. Start with the Rainbow Tower appetizer, then continue with a platter of tender sashimi, and continue with sushi rolls and soy marinated seared ahi tuna. You’ll find The Dolphin only serves the freshest seafood. Fabulous service and enjoyed meeting Chef Dida. Lovely setting overlooking a tropical courtyard at the Shops At Kukuiula. Don’t Miss! If you can book a reservation early evening, you might catch the tail-end of the Farmer’s Market late Wednesday afternoons with live music. For delicious Mexican cuisine, book a reservation at Tortilla Republic! 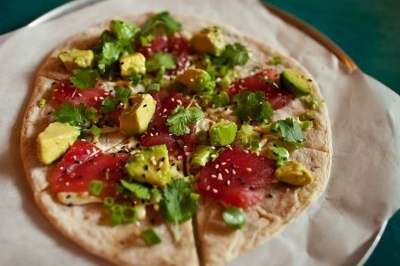 Tortilla Republic serves up inventive Modern Mexican fare with unexpected flavors. Their menu includes natural, organic meats and locally grown produce. Our favorites included the braised pork carnitas, tacos, short ribs. Excellent service and great margaritas. Dine at award-winning Gaylord’s Restaurant at Kilohana for lunch, dinner or Sunday brunch. It’s a classic Hawaiian setting surrounded by a working plantation with 67-acres of fruit orchards, taro fields and farm, including wild boar. The manor is an authentic historical landmark where guests can enjoy their meal seated in the inner courtyard with views of Mt. Waialeale in the distance. Chef Todd Barrett and his culinary team present the freshest, seasonal ingredients supporting Kauai’s local farmers and fishermen, using fresh produce and herbs from the plantation gardens too. Don’t Miss! 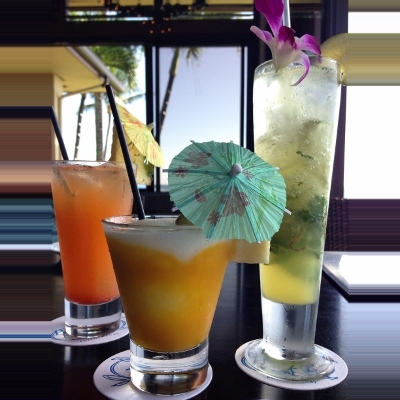 Stop by the award-winning Koloa Rum Tasting Room before or after your dining experience at Gaylord’s. JO2 presents artistic plates of Kaua`i-grown bounty from heirloom vegetables and the freshest ingredients from the sea. Owner Josselin draws upon influences from native France and the pure flavors of Japanese cooking combined with Hawaii’s ingredients to present exquisite cuisine. Located in the town Kapaa, only 10 minutes north of Lihue. For a relaxed Hawaiian setting and fare, visit Brenneckes Beach Broiler, a local landmark, where you’ll find great sunset views along Kauai’s southern shores of Poipu. It’s the best casual food on the island. You’ll find delicious food at lunch, dinner and happy hour — order seafood, pasta, steak and pupu platters. Flip flops are ok. Ask for Shaning – he’s an awesome server! And order a Mai Tai at this famous institution, home of serving 1,000,000 mai tais to visitors from around the world. Visit St. Regis Princeville for classic cocktails at sunset, and you’ll see nature’s best performance as the sun sets over Hanalei Bay with Makana Mountain (Bali Hai) as a backdrop. Order sushi and enjoy appetizers created by the chef’s of Kauai Grill. Entertainment nightly featuring the distinctive sounds of local artists. 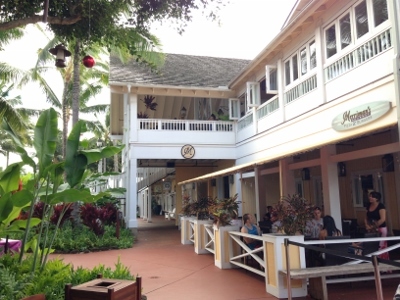 While shopping at Kukui’ula Village in Poipu, stop by Merriman’s Pizza & Burgers for a lunch. We ordered a grilled shrimp salad and the freshly squeezed pineapple & guava drink. There’s also the Merriman’s Fish House upstairs where you can experience the authentic flavors of Hawaii. 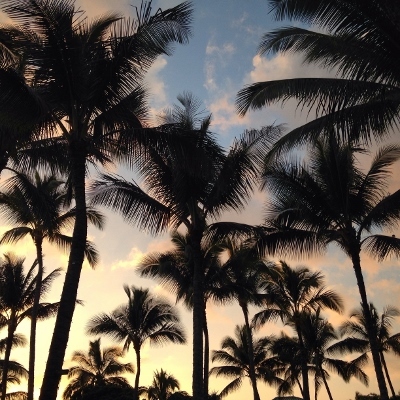 Reliable rentals to see the sights of the Hawaiian Islands. We received prompt and professional service from J& J Rental Cars. It was helpful to have our own car to explore the island of Kauai. Book a reservation at click here. Visit the Hawaii and Kauai Tourism Sites for more details, click here! More Articles on Kauai’s top spots for vacations! If you found this article helpful, visit www.GlobalAdventuress.com to find more articles on Kauai. Global Adventuress thanks those mentioned in this article for hosting us during our stay.